The original 1992 dark comedy will plunge a wooden stake through the heart of Blu-ray this September. 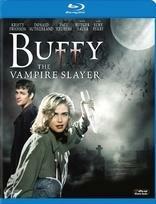 In an early announcement to retailers, 20th Century Fox has revealed 'Buffy the Vampire Slayer' for a Blu-ray release on September 13. The film stars Kristy Swanson in the titular role (that would eventually be passed on to Sarah Michelle Gellar for Joss Whedon's TV series) and co-stars Donald Sutherland and Paul Reubens ('Pee-Wee's Big Adventure'). The Blu-ray will feature a 1080p digital transfer with a DTS-HD Master Audio 7.1 soundtrack, and supplements have yet to be revealed. Suggested list price for the Blu-ray is $24.99. You can find the latest specs for 'Buffy the Vampire Slayer' linked from our Blu-ray Release Schedule, where it's indexed under September 13.